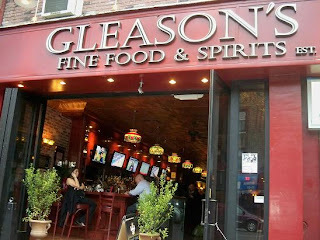 Gleason's on Broadway has been open for about two and a half weeks now, and it's buzzing. The cheery vibe and sports-oriented atmosphere makes it a social place to visit, and it's lovely how they open up the front on warm days. While I haven't been yet, I'm planning to check it out on Tuesday for Cinco de Mayo. They'll be having some specials and I'll get back to you about the details, as they're still being finalized. In the meantime, below is more information about their daily happy hour.